Hilton Head Magazines: CH2/CB2: Are You Lonely, Too? Just as there are varying degrees of love (like eros, philos and agape), there are varying degrees of loneliness. I’m sure at some point you have felt some form of loneliness. I know I have. Whether it was that exhilarating, yet disturbingly ultra-quiet morning I woke up to my first place without a roommate, or traveling alone in a foreign country for two months, or being on bed rest for five months, or simply working from home with all the children at school and a blank computer screen yelling, “Write!” at me, I am pretty sure loneliness and I have been acquainted. There is something that happens to us when we feel lonely that is physical, mental and even spiritual. At first, our bellies feel empty—and not in a good way but in an insatiate, uncomfortable way. And then our minds wander. We think about people that should or would have been there. We think about scenarios. And depending on the severity of the loneliness, and what induced it, we think about what it would take to feel less lonely. For me, loneliness has often seemed intimidating but doable, because there has always been a light at the end of each of my lonely tunnels. 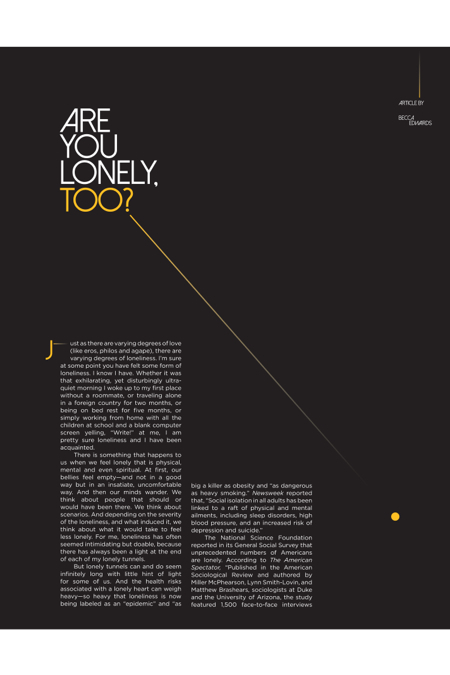 Up to 30 percent of 21- to-50-year-olds say they are lonely sometimes or often. For 15 -to-20-year-olds, it is as high as 71 percent. Oddly enough, with FaceTime, Facebook, free wifi, current phone plans and the like, it is now easier now than ever to connect. As my husband so succinctly put it, “It used to be the quickest way to send a message was a man on a horse. Now we can instantly send messages.” Though I feel a gravitational pull away from Facebook, I logged in the other day to find I had over 1,200 “friends.” This to me was interesting, because in truth I cannot name more than 20 or 30 people I actually know, have something in common with, and/or rely on—and that includes flaky family members that are more situational than constant. Kolud intends to connect people by having a person input their friend contacts and then list easy bucket list items they want to do and then cross pollinate the two in hopes that we are able to not only accomplish things like trying the new Mexican restaurant downtown but actually doing this with friends and being more social. From what I can see, this app seems well thought out and well-designed. But the bigger question is, do we need an app for this? Why do we need an app for this? Why can’t compassion, companionship and our innate need to socialize salve the apparent wound left by loneliness without the aid of technology? Are we de-evolving from interfacing? “No, we are not de-evolving, but we are interacting differently,” said Dr. Debi Lynes, LPC, CEDS, who first attributed this to a more transient existence and then to social media. “Social media provides us with a one-sided conversation that tends to portray specific information. You usually post when you have good news or wishing someone happy birthday.” Though Lynes admits that this borage of happy information can be overwhelming for some because it can make them compare themselves to others and challenge their happiness, she said, “I am a proponent of social media because it has the potential to remind us to be thoughtful and to say happy birthday or catch up with an old friend.” Lynes went on to discuss the difference between being stressed and being busy and pointed out, “There are many days I am too busy but not too stressed to connect with other people.” She said, too, that there is a social deceleration between the ages of 25-45 due to factors such as family, work and daily duties. Interestingly enough, however, when we let ourselves become too busy to connect, we then experience stress related to loneliness, which becomes a vicious cycle as our stress mounts and we become more antisocial—especially for men. But many women can stop this cycle. In her book The Hormone Cure Dr. Sara Gottfried writes, “The original data on stress response was gathered from men by Walter Cannon, the doctor who coined the term fight or flight. The assumption was that it would apply equally to women. Newer data shows that stress elicits a different reaction in women—what Professor Shelley Taylor of the University of California at Los Angeles calls tend and befriend.” Gottfried then explained that when women interact with other women, they produce oxytocin (the “love hormone”), which lowers cortisol. This is one reason experts believe women live longer than men.